Backup restoration is one of the essential tasks every server administrator must know how to perform. Under cPanel it is really simple to restore full backup of one account. 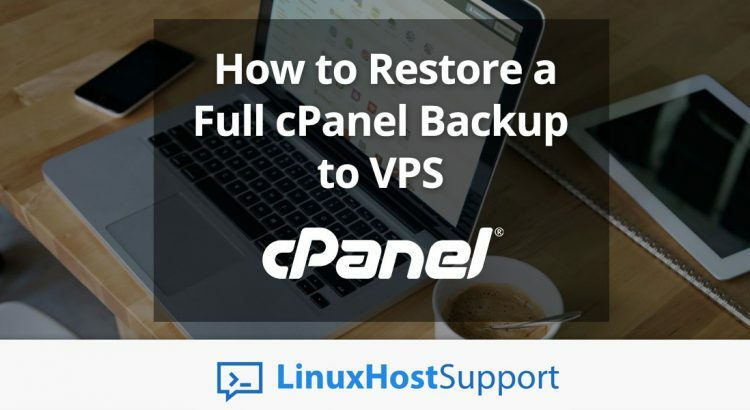 In this tutorial we are going to show you two very easy methods about how to restore a full cPanel backup to a Linux VPS. The first method is to restore the full cPanel backup via WHM. Of course, in order to be able to restore the backup using this method you need to have root access to WHM which is listening on port 2087. So if your domain is example.com, you can access WHM via web browser at https://example.com:2087. Once you log in to WHM, navigate to Backups and then select Restore a Full Backup/cpmove File. 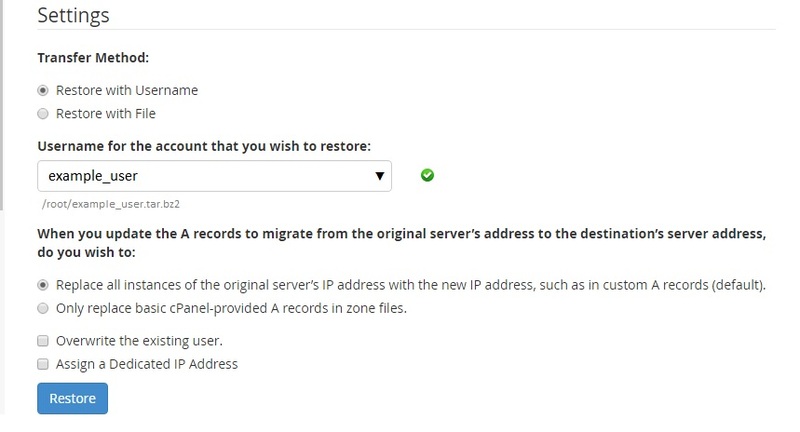 This WHM feature will allow you to restore specific backup by choosing one of the two possible methods, Restore with Username or Restore with File. For example, if the username for the account you want to restore is example_user you should select the username from the drop down list. See the screenshot below for more details. If there is no full cPanel backup uploaded in one of the above directories for that username, it will not be available for selection. Therefore, make sure that the full cPanel backup is properly uploaded on your cPanel server. Once you are ready to restore the backup, hit the Restore button and let cPanel do its work. In case you want to restore a full cPanel backup using a file, select Restore with File, then click on Choose file and select the backup file from your local filesystem. The backup file will be uploaded on the server and restored. Of course, you need to replace example_user with the actual username for the account you want to restore. Also, make sure that the full cPanel backup is properly uploaded in the /home directory on your server before starting the restoration process. For more information we recommend you to refer to the WHM/cPanel documentation. The article describing the full cPanel backup restoration process is available at https://documentation.cpanel.net/display/ALD/Restore+a+Full+Backup+cpmove+File. Restoring full cPanel backup on a Linux VPS is an easy task if you use one of our Linux Host Support Services. Simply ask our expert Linux Administrators to help you restore the full cPanel backup on your server for you, and it will be taken care of immediately. They are available 24×7, so you can get the help you need at any time.